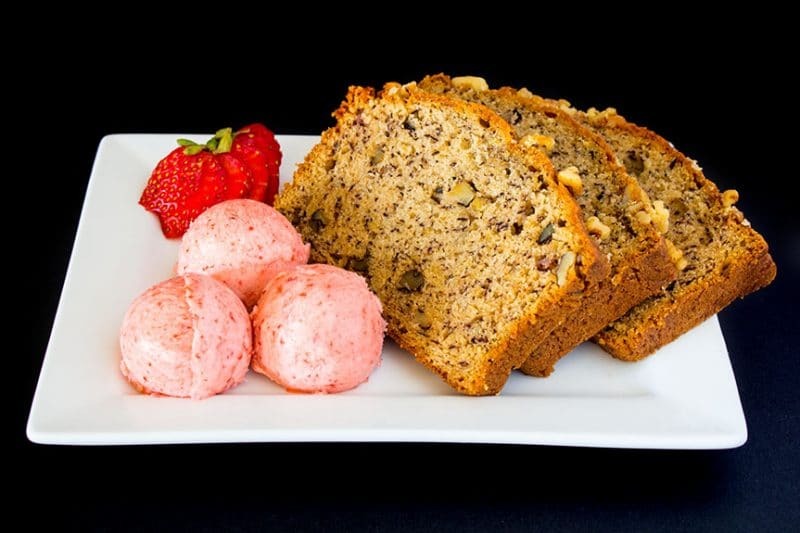 Banana nut bread recipe with a bonus strawberry butter recipe that compliments each other perfectly. Both ran hand-in-hand with the strawberry salad with mango coconut dressing at a restaurant we used to eat at in Florida. The banana bread would come out in the bread basket and a little tub of strawberry butter served with the menu. The other banana bread recipe has a pretty strong banana and brown sugar flavor that seems to overpower the strawberry butter. This recipe would be fine on its own, and the walnuts on the top of the loaf give it a great crunch. 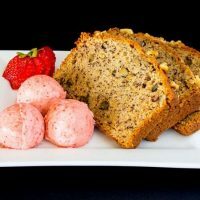 This banana nut bread recipe has a mild banana flavor that compliments the strawberry butter, rather than overpower it. You really want to taste the fresh strawberries when you take the time to make strawberry butter. Pulsing the strawberries in a food processor makes quick work of dicing the strawberries. Do not try to make the strawberry butter in a food processor though. It will look weird, taste great but not something you would want to serve to guests. Yes, this is from personal experience. Occasionally “shortcuts” turn into way more work. Kind of like taking a back road make out of dirt and ruts to beat traffic, only to get a flat tire. I’m not saying you can only eat this strawberry butter with banana bread. It is also good on bagels, warm rolls, or anywhere else you might want to use a sweetened butter. Strawberry butter is one of those things that I have just made the same way as my honey butter. A little of this and a little of that. These proportions are just a starting point. Add more or less of any of the ingredients. It’s your kitchen. Ripened bananas are not required for this recipe. I don’t always have overripe bananas in the house, so I make this with yellow bananas with minimal brown spots. I have even used bananas I picked up in the store on the same day. I just mash them up and use them. A fork, a potato masher, or hands will work just fine. Freezing overripe bananas is another option for always having bananas on hand for baking needs. Just peel them and pop them into a freezer baggie or other freezer container. Allow the bananas to thaw and soften slightly before adding to your recipes. Baked banana walnut bread can also be frozen in whole loaves, half loaves, or even individual slices. Whenever I freeze it, I wrap the cooled bread in waxed paper, followed by aluminum foil and then place it into a large baggie. This method prevents freezer burn. I have safely stored mine for 3 months. Banana bread using yellow or overripe bananas and oil, served with butter made with fresh or frozen strawberries. Spray bread pan with cooking spray. Line the long sides and bottom with a piece of wax paper or parchment paper. Spray paper with baking spray. In a small bowl combine flour and baking soda. Set aside. In a mixing bowl combine sugar and oil. Mix well. Add the flour mixture, blend until flour in completely incorporated. Add the bananas and sour cream. Mix until blended, but do not over mix. Bake in 325 degree F oven for 45 to 60 minutes. Time will depend on the moisture content of bananas. Bread is done when a toothpick inserted into the center of bread comes out clean or with a few crumbs. Remove from oven when done. Allow to cool at least five minutes before removing bread from pan. Finely dice strawberries, or give them a few pulses through a food processor. Set aside. In a mixing bowl, beat butter until light and fluffy. Add 2 tablespoons of powdered sugar and beat until no lumps of sugar remain. Taste and add more sugar or strawberries if necessary.